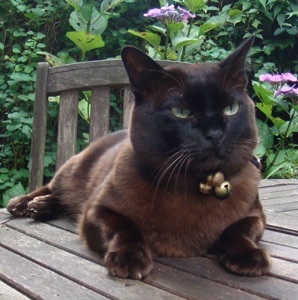 It is with great sadness that we have to tell you of the passing of our beloved cat, Brutus. For those of you who have been aware of the shock diagnosis and prognosis over the last five weeks, you will also know of the subsequent successful operation to remove the lymphoma tumour, his short-lived recovery, his aversion to the chemo and finally the intrusion of the secondary tumour on the liver. We feel that our vet Thomas, the Burmese breeders Sue and Alan, and hopefully ourselves did all we could to try and make his final days more comfortable. He returned to his home last evening after having been diligently looked after by Sue and Alan while we were away. He was unable to eat, was dangerously thin and let us know with his big eyes that he was more than ready to go. I know many of you who met him found him as irresistible a character as we did. In turns he was a swaggering muscular hunter (our previous vet, Mary, called him an 'oriental thug') who not only claimed his home as his territory but also the entire road and the surrounding woodlands. At other times he was the sweetest, most lovable cat we have ever known. Intelligent, funny and persuasive. He could charm even the most ardent cat-hater and of course, literally, the birds off the trees. His prowess at rat-catching was legendary and Highgate will never know the like again! He has left his indelible presence on our house, and if - as Yeats chose to believe - he is dreaming back now, then we hope his dreams are of prowling through the garden on a spring day, taking in the sights, scents and sounds that made up the home he loved, and into which we welcomed him so willingly. We know that many of you have suffered the pain of losing a beloved pet, and thank you again to those who expressed concern during these traumatic few weeks. the hunter celebrates his kill. he slid into his other life, the night. he extends a fisted claw in sensuous affection.